Amid increased talk of a special session over other issues, both the Texas House and Senate voted Saturday evening to approve a $217 billion, two-year budget, the only bill lawmakers are required to pass. House Appropriations Chairman John Zerwas, R-Richmond, and Senate Finance Chairwoman Jane Nelson, R-Flower Mound. Both chambers of the Texas Legislature voted Saturday evening to approve a $217 billion, two-year budget that would boost funding for the state's beleaguered child welfare agency, increase the number of state troopers on the Texas-Mexico border and avoid serious reforms to the state's much-criticized school finance system. The final vote in the House was 135-14. The vote in the Senate was 30-1. Scrounging for cash in a tight-fisted legislative session, budget leaders from both chambers agreed to a compromise that settled a bitter debate over how to finance the state budget. The two-year budget is shored up by both $1 billion taken from the state’s savings account, often referred to as the Rainy Day Fund, and an accounting trick that would use nearly $2 billion from a pot of funding intended for highway projects. The House had favored tapping the Rainy Day Fund and leaving the transportation funding alone. The Senate had taken the opposite position. "The budget today is a product of what is a true compromise" between the Texas House and Senate, said state Rep. John Zerwas, R-Richmond, the lower chamber's lead budget writer. The two legislative chambers originally unveiled budgets that were nearly $8 billion apart. Across the Capitol, Senate Finance Chairwoman Jane Nelson, R-Flower Mound, laid out the budget compromise to the upper chamber at the same time. “This budget is smart. This budget is compassionate. It makes huge advances in several of our priority areas,” Nelson said. Added Lt. Gov. Dan Patrick, who presides over the Senate, after the vote, "The budget has settled where the Senate wanted it to settle." The compromise proposal was skimpier than the original budget draft that the House voted out in April. In the House, the final version won the approval of Tea Party Republicans who had originally opposed the House version, while losing the support of almost one-third of the chamber’s Democrats. State Sen. Sylvia Garcia, D-Houston, was the lone no vote in the upper chamber. "This budget is more of the same and fails Texas families," Garcia said in a statement. "There's no new money for pre-k, there's continued spending on more border militarization, and it continues to shortchange education and healthcare." The budget includes funding to cover growing enrollment at public schools, but it reduces state funding for schools by about $1.1 billion. That funding is offset primarily by growth in local property taxes. Zerwas said state officials anticipated there would be a shortfall of around $1 billion that lawmakers will need to address when they return to the Capitol for the next regular session in 2019. The budget does not fully fund expected cost growth in certain programs, most notably Medicaid, the federal-state health insurance program for the poor and disabled. Lawmakers set aside more than $500 million in additional funds for the state’s child welfare system, which has lately faced a shortage of foster homes and front-line Child Protective Services workers. In addition, lawmakers used funding from the Rainy Day Fund to make repairs to various state buildings including mental hospitals, state-supported living centers for people with disabilities, and the historic Alamo. State lawmakers had less money at their discretion this year in crafting the next two-year budget. By cutting taxes in 2015, the Legislature reduced state revenue available to them for this session by about $4 billion. Lawmakers also dedicated nearly $5 billion that year to highways — a move that voters later approved in a statewide election — which left fewer dollars for priorities like health care and education. In addition, a moderately sluggish economy slowed revenue growth, leaving the state's coffers emptier than state officials had projected. One point of contention that riled House Democrats was the budget's treatment of pre-Kindergarten funding. Lawmakers directed $236 million to go to a “high-quality” program for youngsters, but state Rep. Eric Johnson, D-Dallas, criticized that proposal because it would divert existing school funds, rather than adding new ones. Johnson said he worried that Texas was asking school districts to raise their standards for pre-Kindergarten programs, “but we’re not giving them the resources to do it.” Johnson voted against the budget. Another debate in the House revolved around a state-funded health care program for children with disabilities. The two-year budget would slightly boost payments to speech, physical and occupational therapists treating needy children in the state’s Medicaid program, but that would amount to a restoration of only about one-quarter of the funding cut by the Legislature two years ago. The House wanted more funding for therapy services, but the Senate opposed spending any more, Zerwas said. State Sen. José Menéndez, D-San Antonio, said he had hoped for more funding to pay therapy providers. "I appreciate the 25 percent rate therapy increase but I'm not sure how far that will go," Menendez said. "I'm concerned we have providers leaving and I'm not sure we have the full picture of why they're leaving." State Sen. Charles Schwertner, R-Georgetown, who led health and human services negotiations on the budget, said a provision of the budget will require state officials to track how many therapy providers are available to Medicaid enrollees, "to make sure we're not dropping he ball on any lingering or growing concerns." 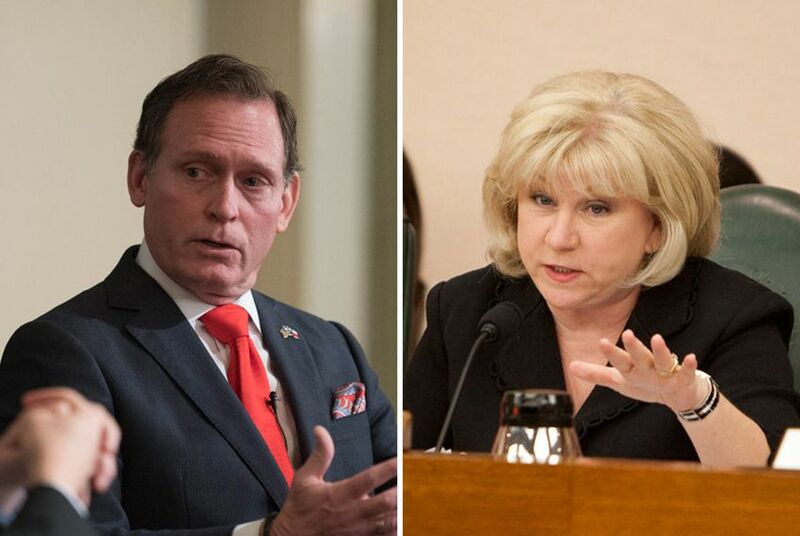 On higher education funding, a topic that sparked controversy early in the legislative session, budget writers mostly avoided a major overhaul of university funding that the Senate had championed. The upper chamber had pushed for the elimination of a budgeting tactic known as "special items," through which universities and colleges get dollars for specific projects allocated outside the standard funding formulas. The House opposed the elimination, saying it was too drastic of a move to take without further study. In the end, the chamber's budget negotiators decided to study the issue instead of making immediate changes. Though the preservation of "special item" funding will come as a relief to university officials, many schools will still feel some pinch in overall state funds. Comptroller Glenn Hegar must certify that there is enough revenue available to cover the appropriations in the budget before Gov. Greg Abbott can sign it.